More and more people than ever are planning family reunions during their Walt Disney World Vacations. Disney is fun for all ages, but truth be told, there is a lot of walking to be done. If grandma or grandpa isn’t as mobile as they use to be, it may be tempting for them to stay home. I’m here to tell you (and them) that that is a bunch of hooey! Disney makes it easy for people off all ages, and all ranges of mobility to enjoy their time in the most magical place on earth. Take it from someone with mobility issues of her own. A Disney vacation is just as much fun for those that need a little extra assistance as for those that don’t. At each Walt Disney World theme park you have the ability to rent either a standard wheelchair that can be pushed, or an electric convenience vehicle (ECV) that the user can drive. Located near the entrance of each park, the Disney rentals are available in limited quantities and are subject to availability. The earlier you arrive in the day, the more likely your chance to obtain a rental. There are rentals available from outside companies that may have lower prices. However for someone who can walk some distance but occasionally needs a little extra help, I find the Disney option excellent. There’s a learning curve when it comes to navigating the bus system from a chair, that other guests don’t always understand. For myself, being in an EVC at the park, allows me the opportunity to be pain free and walk back to the hotel at the end of the night. 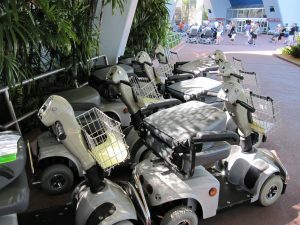 You don’t need to slow down on your Walt Disney World Vacation just because you or a loved one has a problem with mobility. All Disney theme parks are wheelchair friendly with convenient rentals to make your time as a guest filled with pixie dust. This entry was posted on Tuesday, January 17th, 2012 at 2:43 pm	and is filed under How To, Theme Parks. You can follow any responses to this entry through the RSS 2.0 feed. You can leave a response, or trackback from your own site.